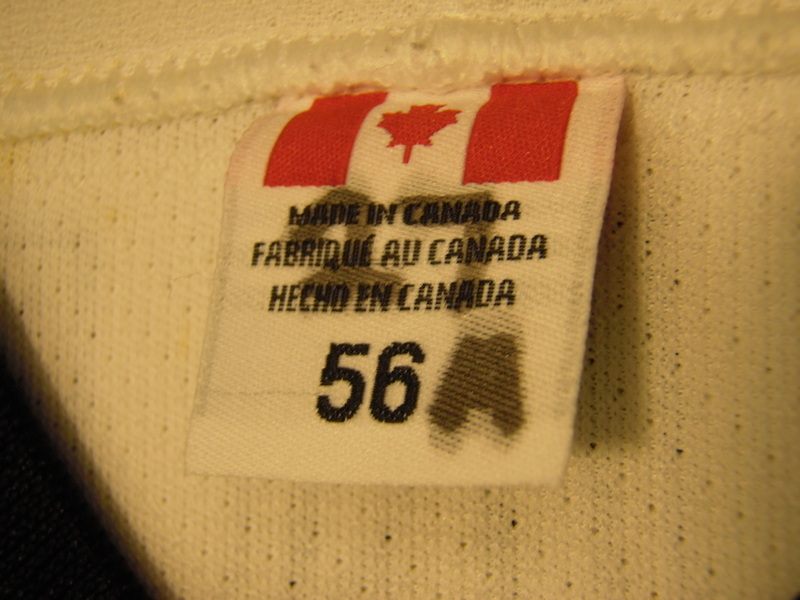 This jersey came to me by way of an ebay seller all the way in Washington state. 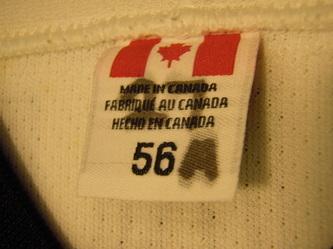 I'd never heard of the seller before, but after establishing some provenance on the jersey and getting some additional detailed photos via e-mail, I was able to buy the jersey with confidence. 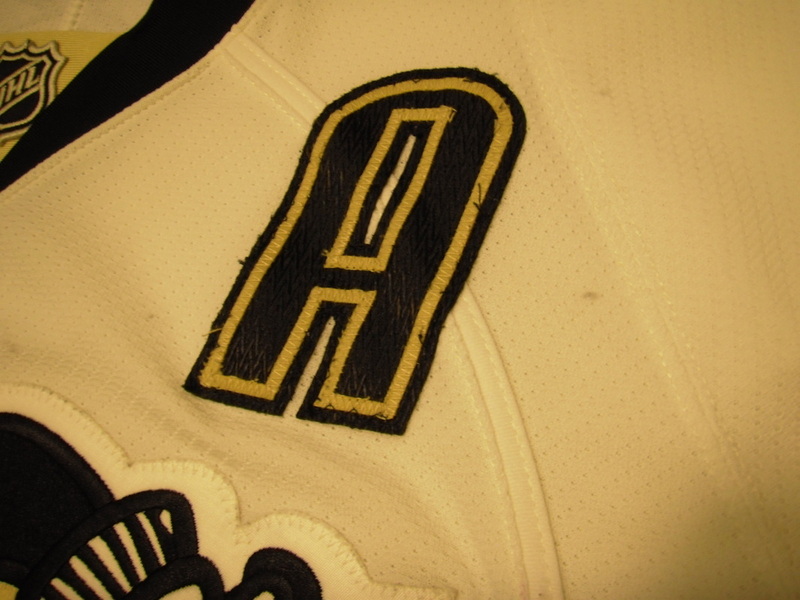 It's got great wear and has some cool team modifications, as well as the alternate captain's A. The sleeves and hem have both been shortened by about 2". The Penguins crest shows some fantastic stick markings and matches well to numerous photos from the 98-99 season, Straka's career high 83 point year. 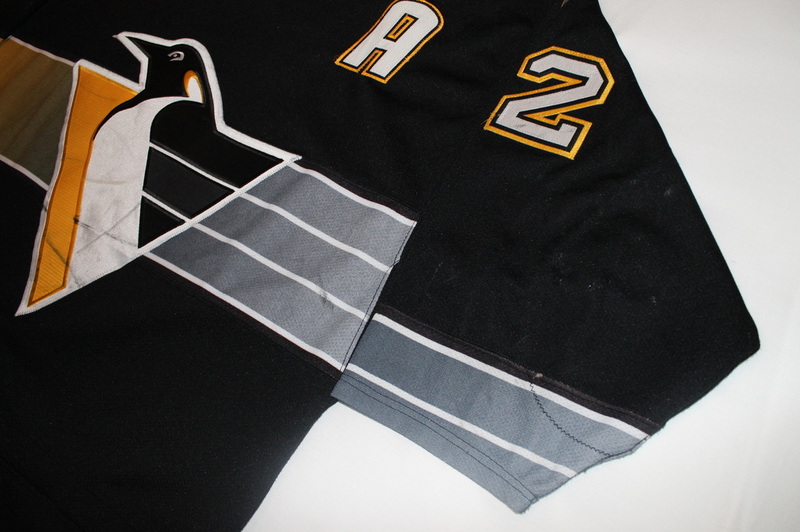 The tri color glacier twill numbering and heavyweight construction of these Starter alts make them a standout in an era of otherwise below average jersey aesthetics. 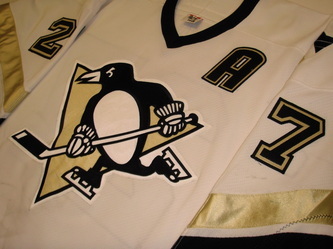 While not my favorite Pens style by any means, one that has aged well in an era of Las Vegas gold and kiss cut numbering. 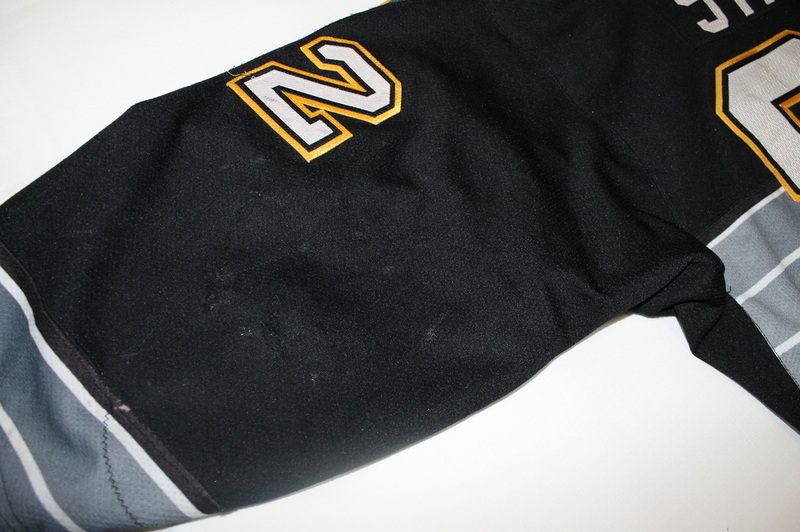 These are sometimes called the "4 color" jersey as they incorporate black, gold, white, and gray into the colorway. These were the first alternate style to follow the original "Sunday gold" of the 80s. 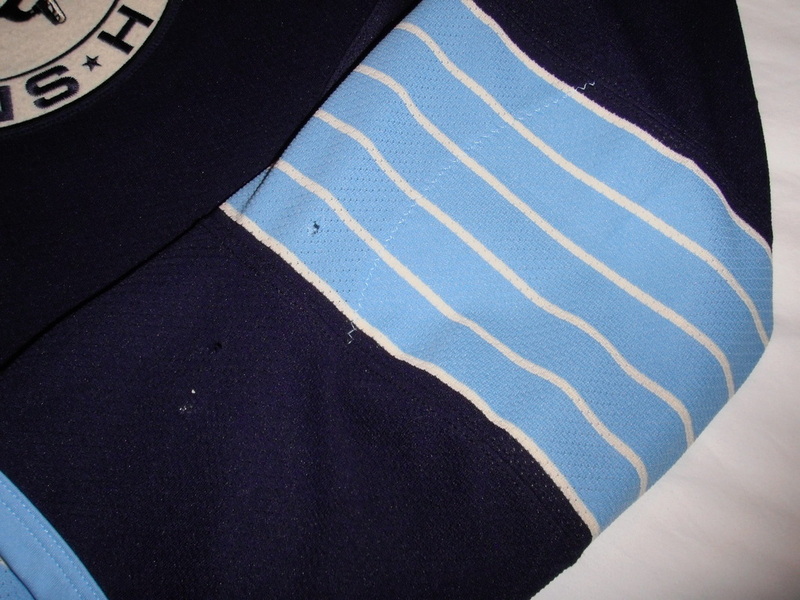 This example has exceptional wear throughout, and although my collection already had a nice wear Straka in it the combination of style + player + wear made this one a must own for me. When it arrived and I got to hold it in my hands and compare it to the photos I'd found online I was very satisfied with my purchase. 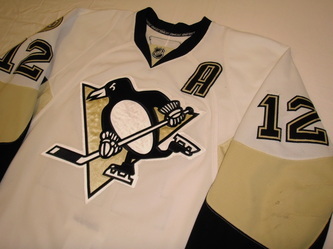 A similarly modified Straka jersey sold on GameWornAuctions.net for over $2500 after hammer + shipping fees. The jersey shows heavy wear in the form of many abrasions and board burns on the elbows and lower sleeves. Many stick markings on the crest. 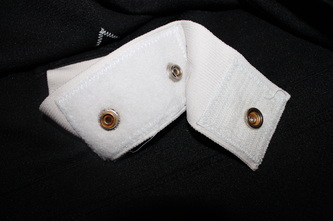 Heavy inner pilling in the underarm and chest area. 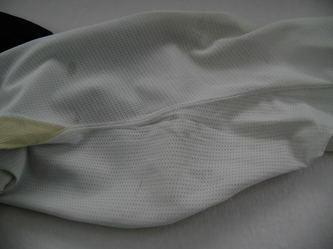 Rusty snap in the fight strap, and dingy white from repeated washings. Shows solid use from an entire half season of play from a 2 set era. 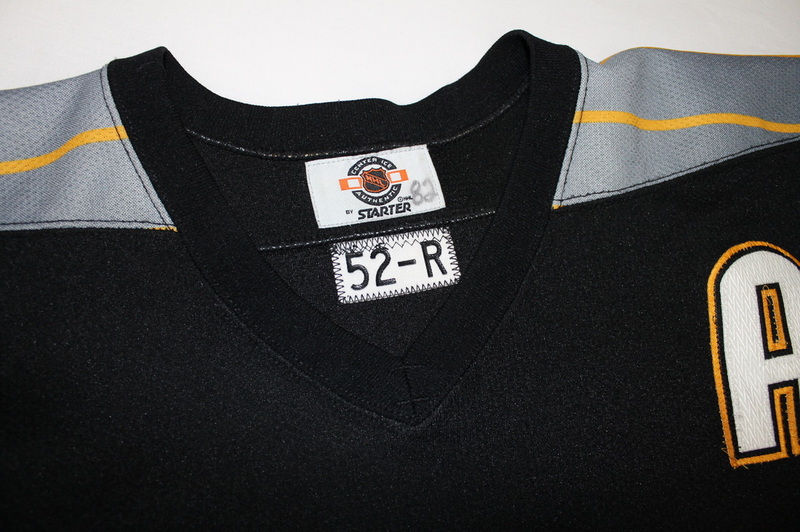 Sized 52 R but with team modifications to accommodate Marty's short stature. It would be appropriate that this one would arrive on New Year's Eve, as Marty was affectionately known as the "Sauerkraut Kid" after having tried it for the first time while playing in Pittsburgh and taking an immediate liking to it. 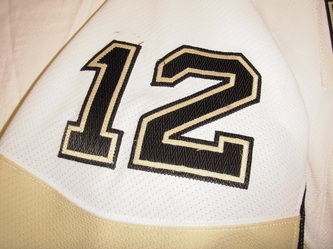 Pittsburghers pretty much can say the same thing about Straka and his time here. His outstanding work ethic and on ice hustle immediately won over the Pittsburgh fanbase. Playing in his home country of Czechoslovakia, Martin Straka played in the 1991 World Junior Championships where he collected a bronze medal and became a highly touted draft pick. 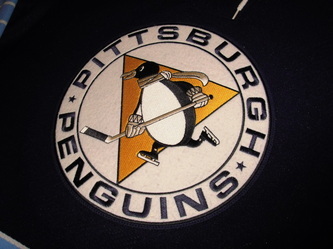 The Pittsburgh Penguins selected Straka in the first round of the 1992 NHL Entry Draft. Before heading to the NHL, Straka was named to the Czechoslovakian all-star team in 1992 and went back to the World Juniors. 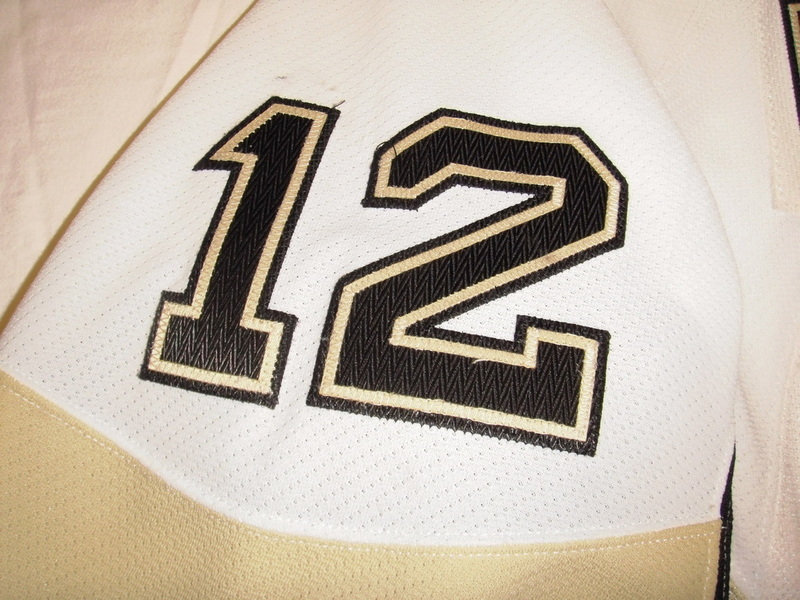 He made his NHL debut in the 1992-93 season; one season after the Penguins had won back-to-back Stanley Cups. 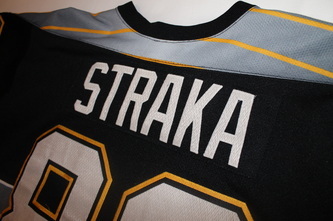 Straka's rookie season was not topped off with a Cup celebration, though he did see his first action in the playoffs while playing a handful of games for the team's IHL affiliate in Cleveland. 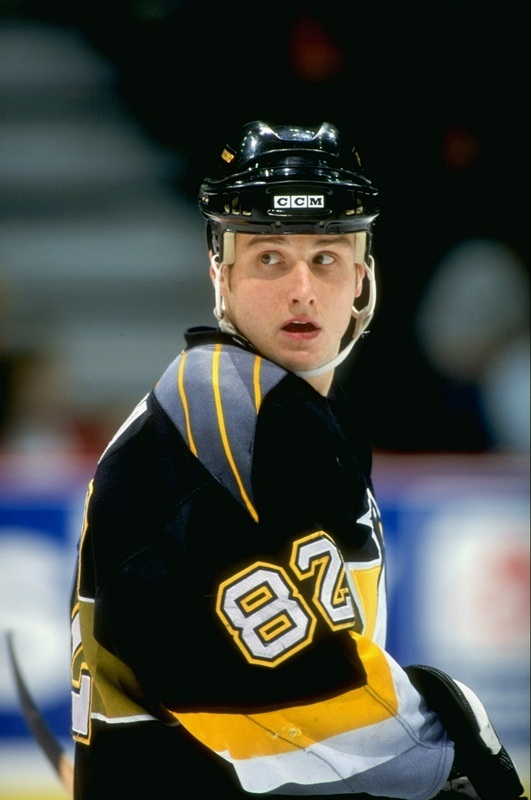 After two more seasons in Pittsburgh, including his first appearance at the World Championships in 1994, Straka was traded to Ottawa where he finished out the 1994-95 season. He was dealt once again the next season, this time to the New York Islanders, who lost him to Florida after they put him on waivers, as the Panthers were gearing up for a run at the Cup. The underdog Panthers went all the way to the finals, but ran into a brick wall when the Colorado Avalanche stormed past them in four games to take the Cup. A member of the Czech Republic's World Cup team in 1996, Straka played one more season in Florida, before going back to the team that drafted him, signing with Pittsburgh as a free agent in 1997. 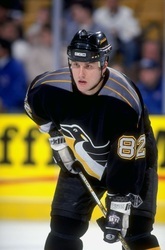 Straka was now joined with Jaromir Jagr and enjoyed great success over the years, including an Olympic gold medal for his home country Czechoslovakia in the 1998 Olympic Winter Games. Although considered a small player in the NHL, Straka makes great moves on the ice and has the canny ability to score goals as well as set up his teammates. 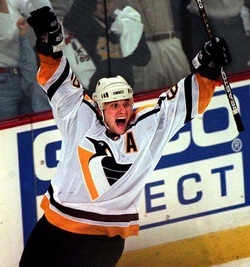 The 2000-01 season saw him collect career highs in assists (68) and points (95) and helped the Penguins reach the Eastern Conference finals. A member of the Czech Republic Olympic team in 2002, injuries plagued Straka over the course of two seasons limiting him to a mere 73 games in 2001-02 and 2002-03. 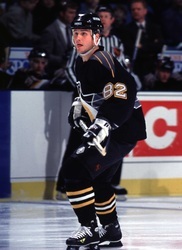 Following his second stint with Pittsburgh, Straka was dealt to the Los Angeles Kings in the early stages of the 2003-04 NHL season. Upon his arrival with the Kings, injuries yet again limited the talented centerman to a mere 22 games. After failing to make the playoffs, the Kings forward was named to the Czech Republic's World Championship team and later that fall suited up for them again at the World Cup of Hockey. With the 2004-05 NHL season washed out, Straka made his third World Championship appearance and was a key player in the club's gold medal victory over Canada. In the summer of 2005, Straka was acquired by the New York Rangers. 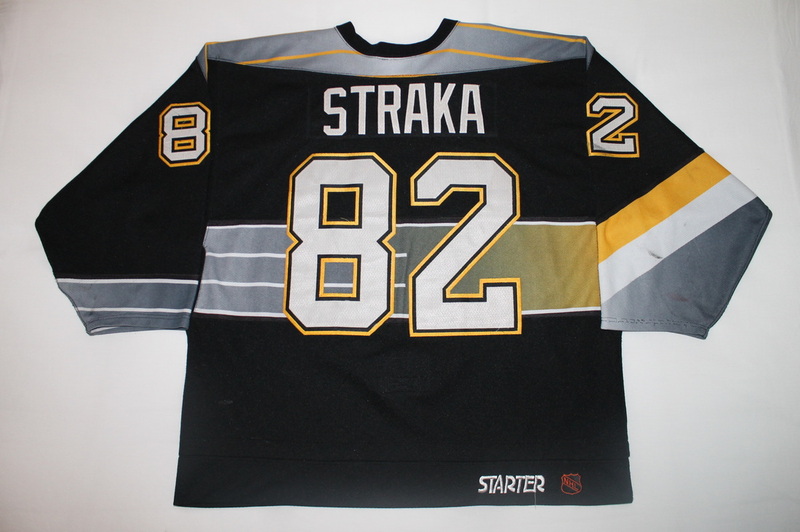 Mid-way through the 2005-06 season Straka represented his homeland in the 2006 Winter Olympics in Turin. 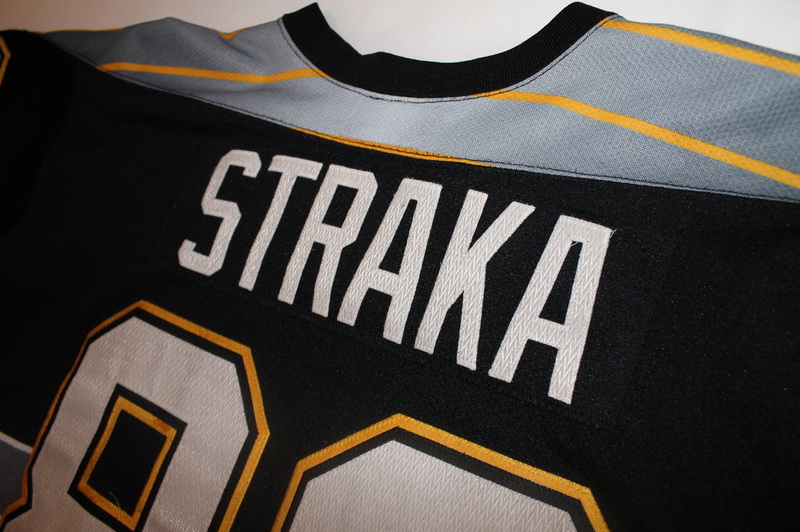 The following season Straka appeared in 77 games with the Rangers and was nearly a point-a-game player. However, his point production dipped during the 2007-08 season when he scored 14 goals and 27 assists. Straka decided to leave the NHL in the summer of 2008 to become the Sports Director of his former former Czech club, HC Lasselsberger Plzen. 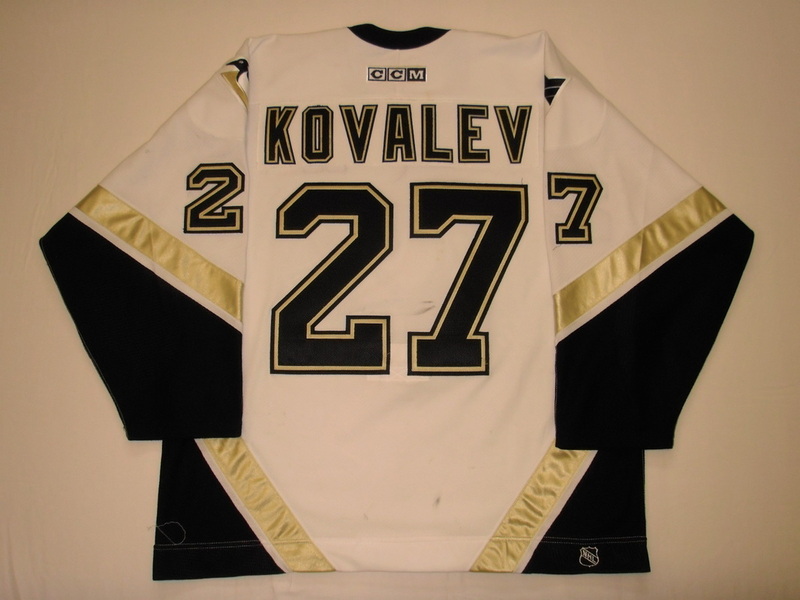 This jersey is an Alexei Kovalev game worn home jersey from the 2002-03 season. The jersey is significant to me as it was worn in the season following my graduation from the University of Pittsburgh, where I was fortunate enough to be a part of the last class ever to have their graduation ceremony held at the Igloo, as the then brand new Petersen Events Center didn't pass it's initial safety inspection forcing a last minute venue change. Back in my college days, I used to be able to buy "Student Rush" tickets to Penguins games on the day of the game for just $20 cash. Many times during and immediately following my time at Pitt I would attend games on these "rush" tickets with my wife, who was then just a girlfriend among other friends. During this time Alexei was by far my favorite member of the Penguins roster and he rarely disappointed us when we made it out to see him play. A prolific goal scorer, Alexei...or Alex as he now prefers to be called, would seemingly score at will using a compact, half wind up slap shot from the top of the circle. 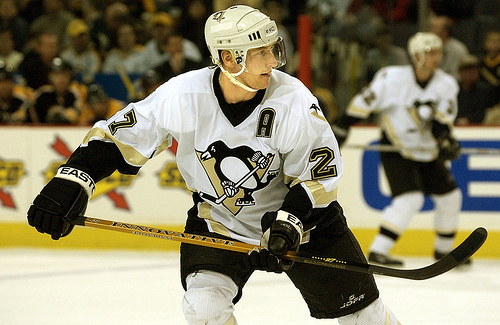 Few Penguins before or since have had a quicker or more accurate release than Kovalev. This jersey is also significant in that it was the first of the modern era white skating Penguins designs, with the black version being adopted as the regular road jersey following its original use as an alternate jersey. 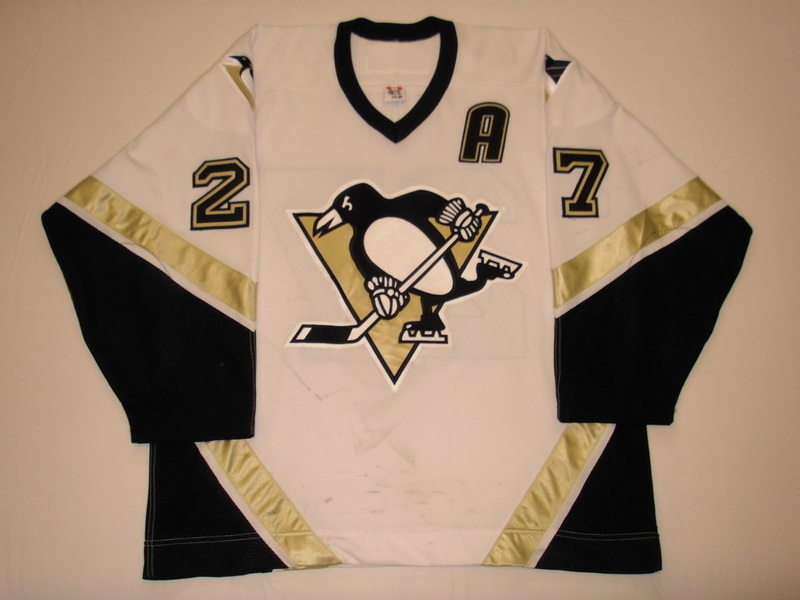 The black skating Penguin alternate was first worn on October 28th, 2000 against the New Jersey Devils with this white design coming almost 2 years later at the beginning of the 2002-03 season. These white home jerseys were made by CCM while the road black versions were tagged Koho. 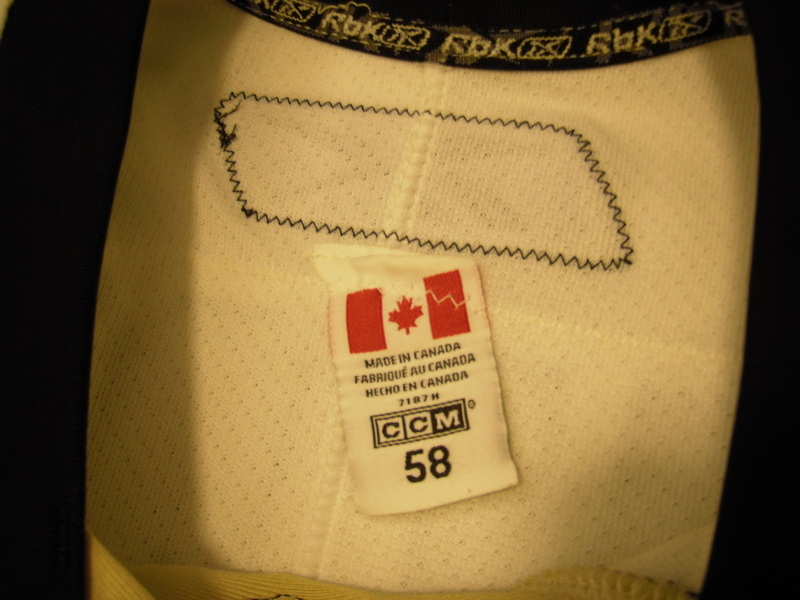 One in the same company, CCM/Koho simply took the opportunity to advertise both brands on the 2 different shirts respectively. This jersey shows good wear in the form of several scattered stick marks and a few very nice board burns on the sleeves. As is customary with Kovalev game worns, the fight strap has been cut off at the reinforcement, as Kovy finds the strap restrictive to his style of play and he rarely finds himself involved in a fight situation. 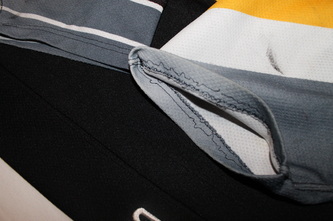 Kovalev has recently returned to the Pens roster and continues to snip the fight strap from his game jerseys. This is a unique player customization that is a good indicator that you've got a real deal gamer on your hands. Originally sold via Leland's in 2007, the jersey retains the original hang tag with lot number as well as the original Leland's paper invoice to the original Arizona based purchaser. This one came my way via a last second sniper bid on an ebay auction that happened to be ending late on a week night. A great jersey at a great price...gotta love it. 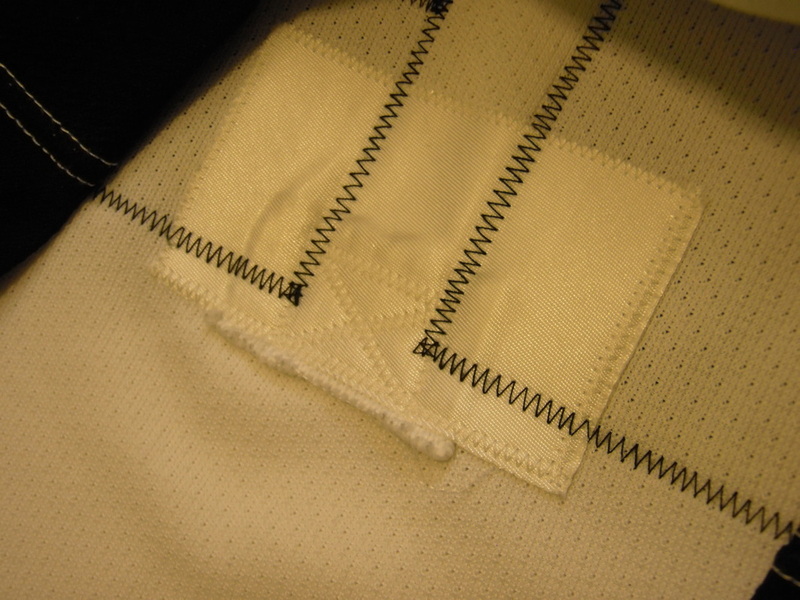 Strangely enough, there is a tag or something trapped beneath the back #2 behind the twill number and the jersey itself. 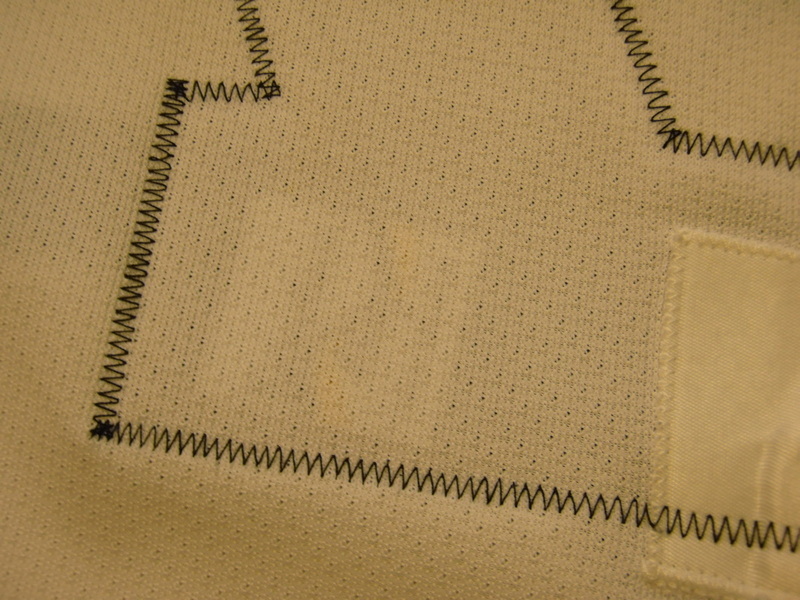 The wash instructions tag has been torn from the inside seam and may be what's lurking behind that back #2 I've never seen this anomaly on a Pens jersey before, so if anyone has any idea what that is or what it's doing there please drop me a line at ErikBarr@aol.com. I seem to learn something new from this hobby nearly everyday. In 1989, at the age of 16, Kovalev was included on the first string of a top-rated Soviet club, Dynamo Moscow. In that year, the mass exodus of Soviet hockey players hadn't yet begun. Even though he stood out among his teammates for his superb skating and original stickhandling technique, Kovalev didn't call the shots.In the Dynamo Moscow lineup, Kovalev flew across the Atlantic to participate in a number of exhibition games a year later. As Yurzinov admitted later, he took Kovalev on that tour in order to give him a chance to see the best of modern hockey with his own eyes and to size up his future opponents. But Kovalev wanted to play and became offended if the coach failed to include him on the playing list for a game. 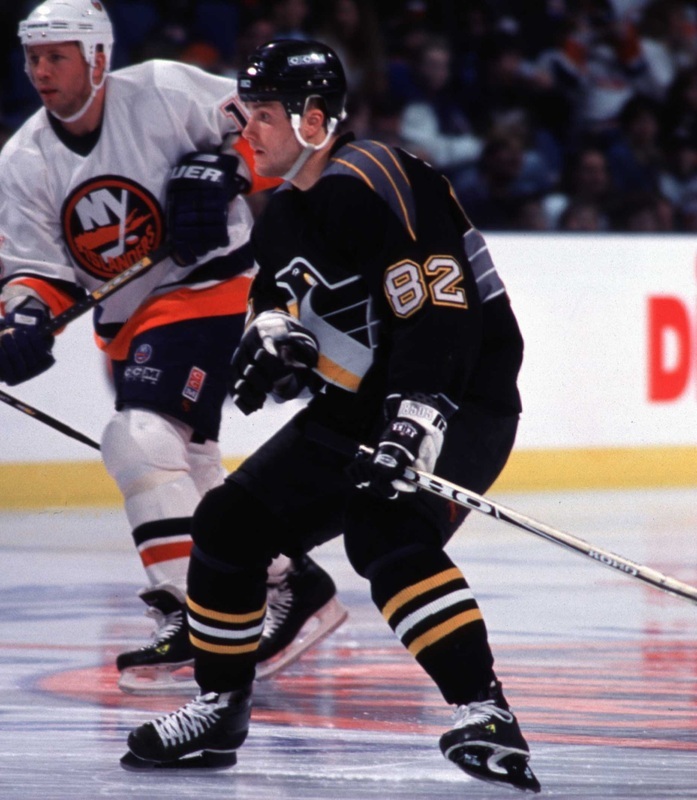 At first, the eminent coach Mike Keenan, followed by his pupil and successor in the post of New York Rangers head coach, Colin Campbell tried to restrain Kovalev's individualistic impulses while on the ice and get the young player to play strictly according to his position. But sticking to his guns and remaining true to his style of play was nothing new to Kovalev. Kovalev was grateful to Yurzinov for his lessons in game strategy and for the limited amount of freedom the coach did allow him within the constraints of the play. To his credit, Kovalev withstood the pressure from his coaches and didn't change his style. Just over a year later, he was playing such a stylish game of hockey that he attracted attention and was offered his first serious position. Keenan actually placed Kovalev on the first forward line with the team's top offensive talent. The Kovalev-Mark Messier-Adam Graves line determined the outcome of the battle for the Stanley Cup in the spring of 1994. To top it off, Messier became a top scorer in the league during the playoffs. With Keenan, one of the toughest coaches in the NHL, Kovalev was able to accomplish that. Many Europeans in the NHL had trouble adjusting to the different style of play after being pressured to give up their own style. Just a little over 20, Kovalev, with his fighting spirit and winning style, had conquered New York. With his peculiar stickhandling and masterly skating, his ability to set up his partners in scoring positions and his powerful shots on goal, he garnered a lot of attention in his new homeland. 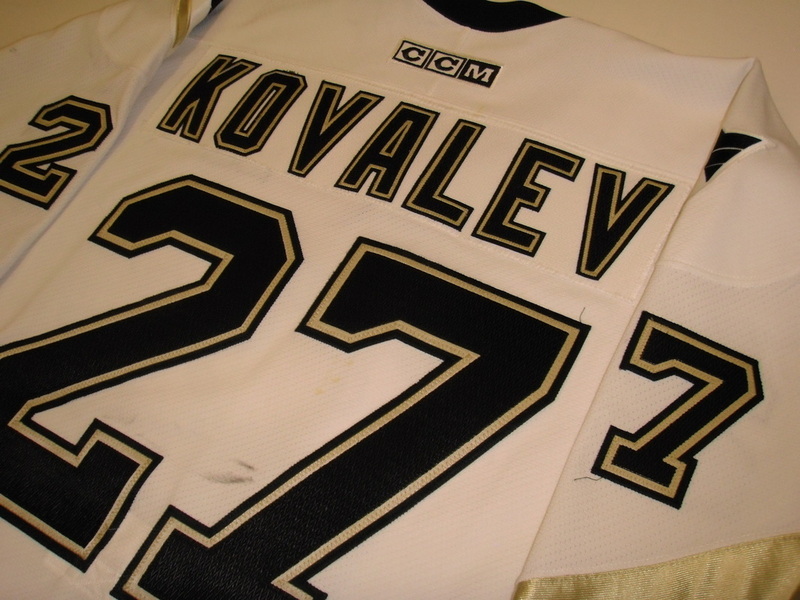 Over the years, fans began showing up for games in Madison Square Garden wearing hockey jerseys with the number 27 and Kovalev's name stamped on the back. 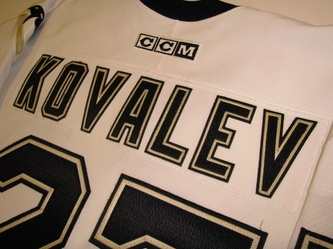 With the Pittsburgh Penguins, which he joined in 1998, Kovalev was allowed to continue his own style of play and immediately became one of the leaders of the team. "Kovy" as he is known to his teammates spent parts of five seasons with the Penguins, where he established a career high 95 points in 2000-01. 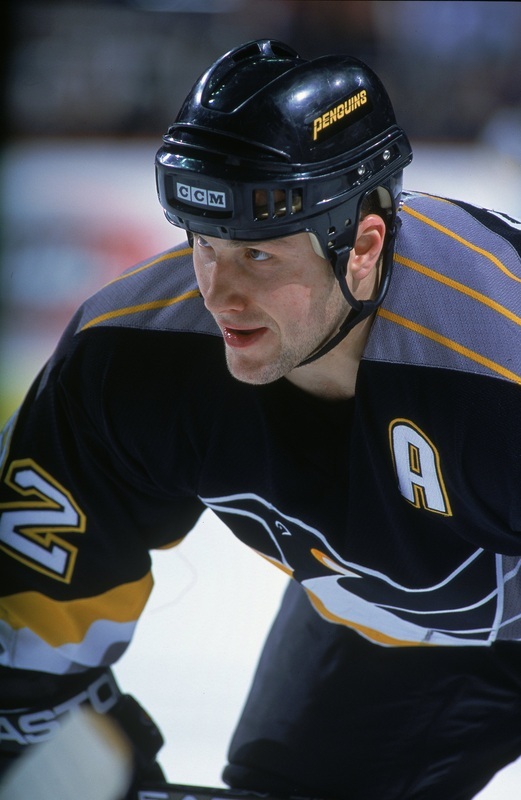 A two-time Olympic medalist, gold in 1992 with Team Unified and bronze in 2002 with Russia, Kovalev headed back to the Big Apple towards the end of the 2002-03 season. After the Penguins felt they would be unable re-sign the talented forward during the off-season, they traded him back to the team whith whom he began his career with, the New York Rangers. In 2003-04, the Rangers struggled and saw that their playoff hopes were vanishing, and as the season progressed they opted to trade the talented forward to the Montreal Canadiens for young prospect Josef Balej and a second round pick in the 2004 NHL Entry Draft. In 2006, Kovalev would represent Russia in the 2006 Winter Olmypics. In his second season in Montreal, Kovalev struggled to produce offensively and at times was heavily criticized by local media and fans alike. 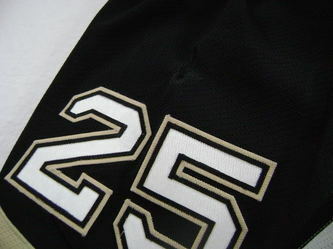 However, he rebounded during the 2007-08 season. Matched with Andrei Kostitsyn and Tomas Plekanec, he tallied a total of 35 goals and 49 assists for a total of 84 points in 82 games. He was called by many the comeback player of the year for his amazing turnaround season, as the Canadiens captured top seed in the Eastern Conference. Kovalev's time in the nation's capital was not as offensively productive as he and the team would have liked, though he did reach a personal milestone while wearing a Senators jersey. On November 22, 2010, Kovalev recorded his 1,000th career point in a game against the Los Angeles Kings. On February 24, 2011, Kovalev's time in Ottawa would come to an end. 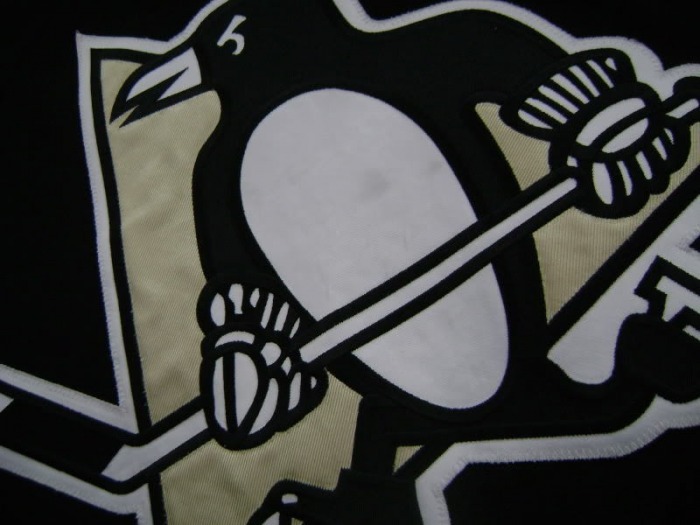 He was traded to a familiar destination, the Pittsbugh Penguins in exchange for a conditional draft pick. 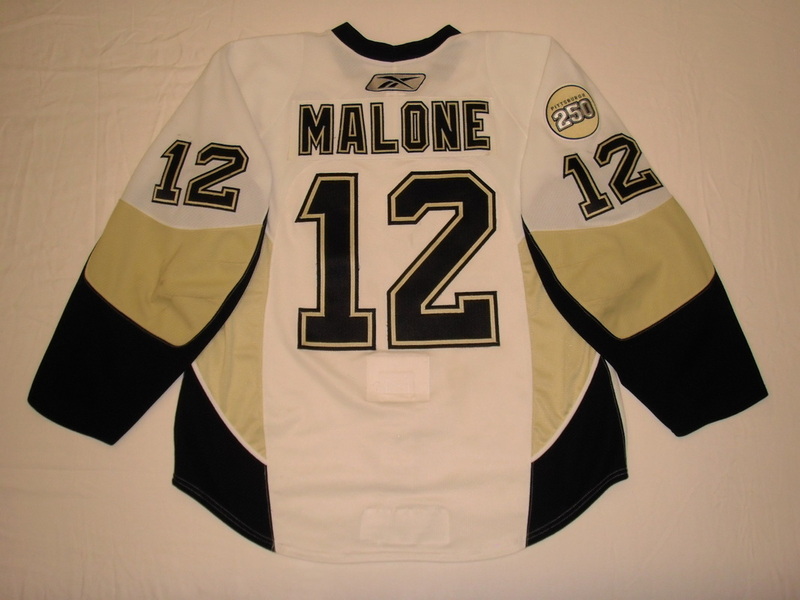 This is Ryan Malone's 2007-08 road white playoffs jersey, worn for all 3 rounds of the Eastern Conference playoffs vs the Ottawa Senators, New York Rangers, and Philadelphia Flyers. 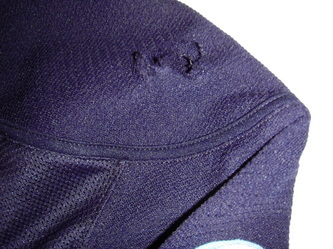 Having been worn in 6 road playoff appearances, the jersey shows moderate wear in the form of several abrasion burns and unrepaired holes and cuts. There is also a cut on the left cuff that is over 1" in length, likely from a skate. 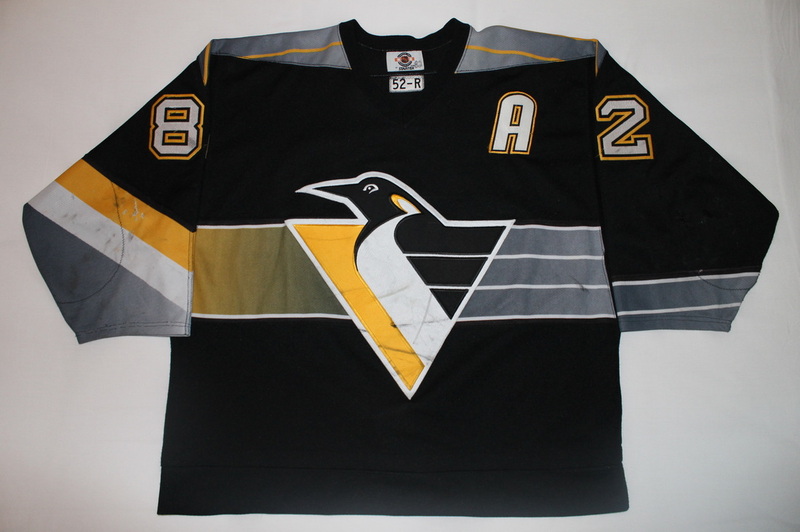 A great looking jersey from a Pittsburgh native, and also one from his time as alternate captain as evidenced by the crudely attached A on the upper left breast. 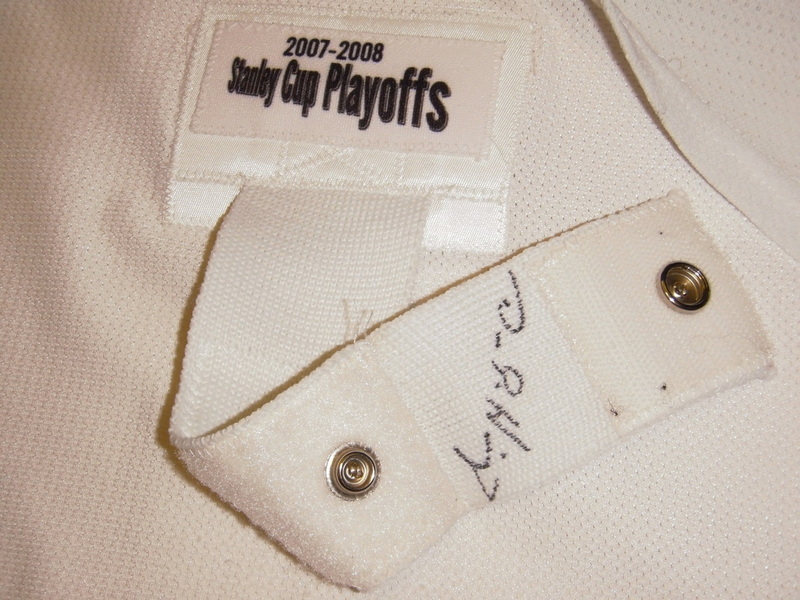 This jersey has the unique extra tag sewn to the fight strap that designates it as a playoff set. 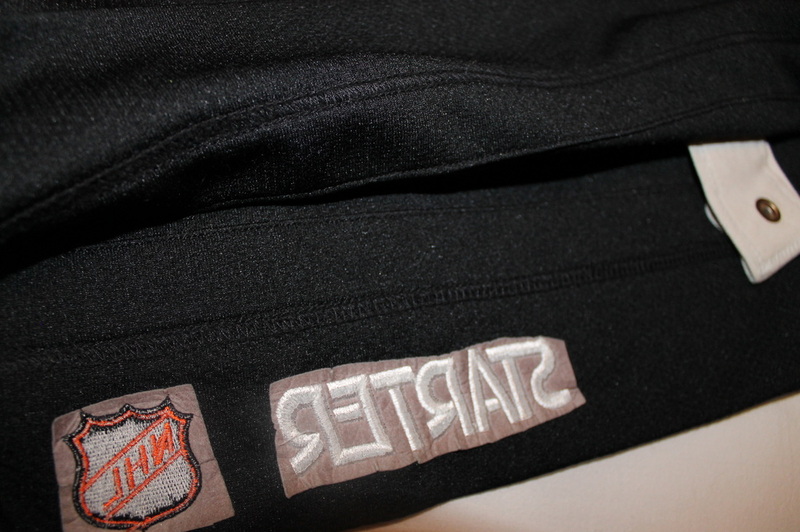 Also has playoff wording on the set tag sewn to the real tail. 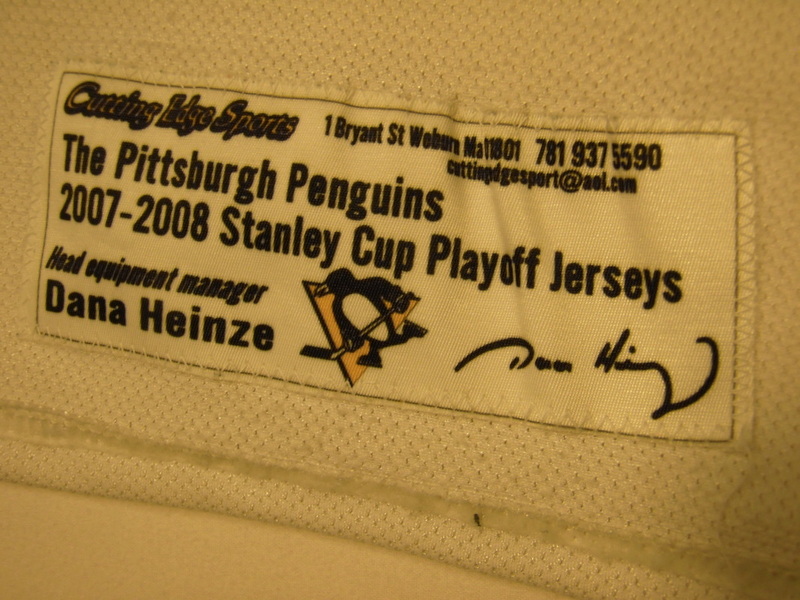 Dana Heinze signature adorns the inside of the velcro snap type fight strap. A generous size 58 to fit over Ryan's large 6'4" 215 lb frame. 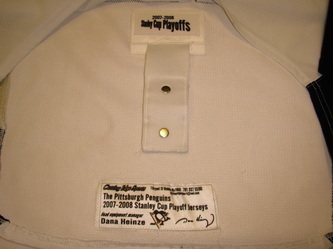 Ryan scored 16 points in 20 playoff games during the 2008 Stanley Cup Playoffs, going for 6 goals, 10 assists, and finishing as a +14 overall. 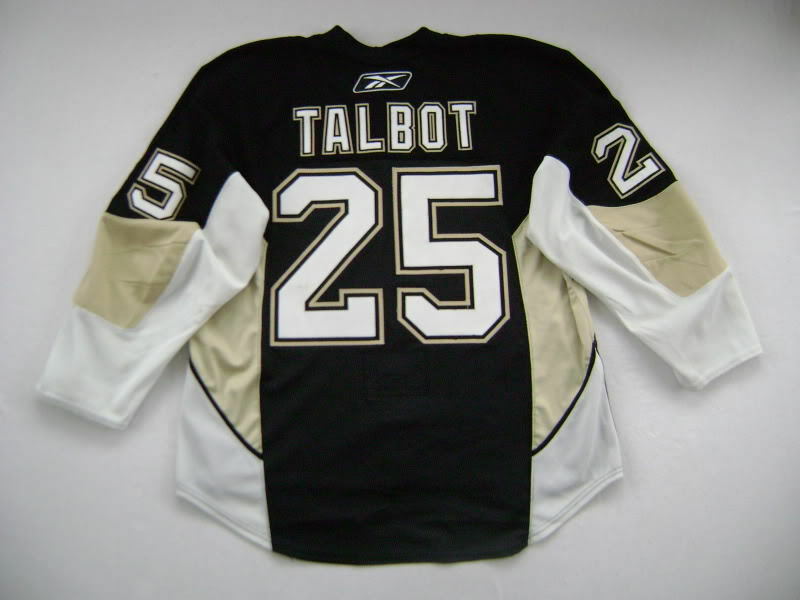 His outstanding playoff performance unfortunately caught the eye of the Tampa Bay Lightning, and on June 28th of 2008, the Lightning acquired exclusive negotiation rights with Malone and Gary Roberts from the Penguins for a third-round draft pick in 2009. 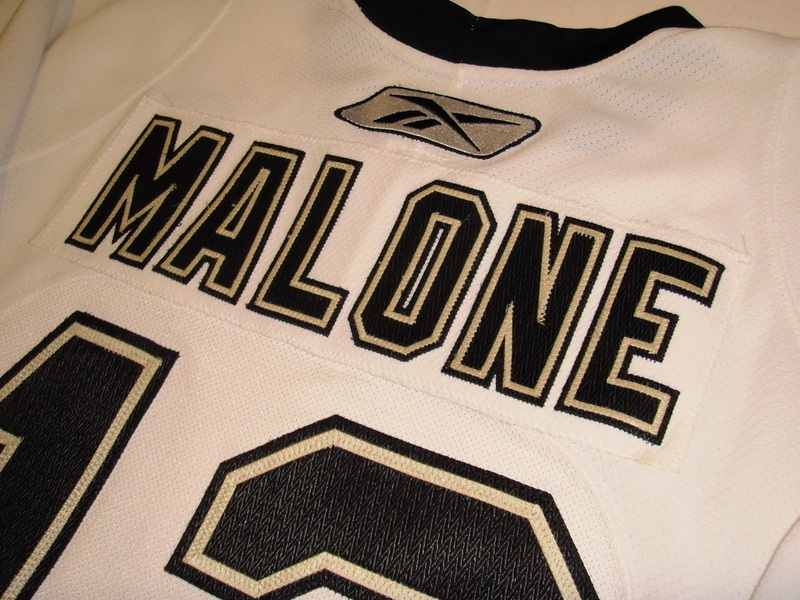 One day later, the Lightning signed Malone to a seven-year contract worth $31.5 million, which paid him $6,000,000 for the first season alone. I certainly miss his presence on the team, but can't blame him to jumping on a deal like that. 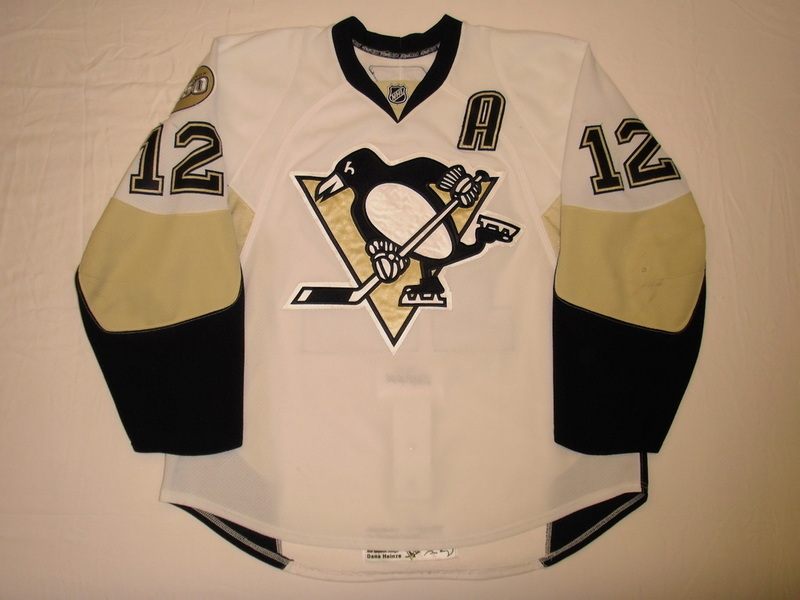 It has been rumored that Ryan also received another $1,000,000 from Simon Gagne when he was traded to the Lightning for Ryan to reliquish his famous #12. 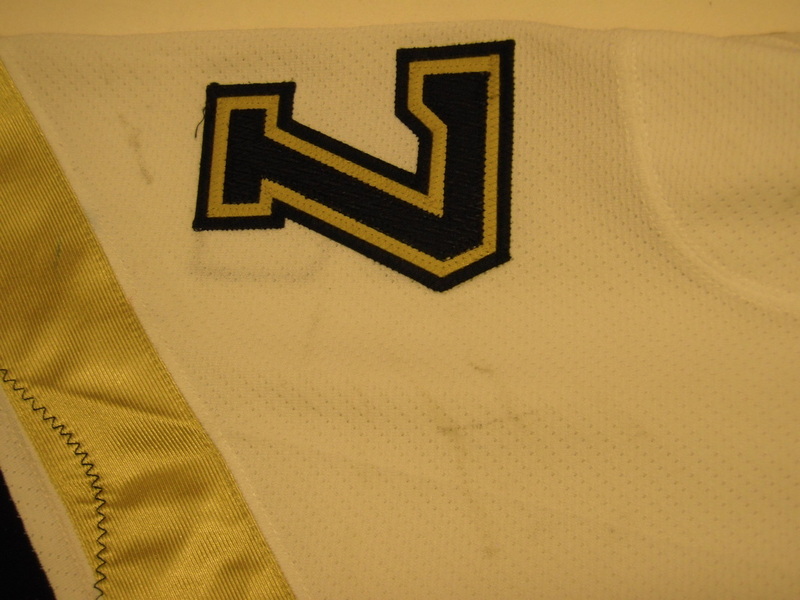 Again, can't blame Ryan for taking the money...I would wear an X on the back of my jersey for a million bucks! 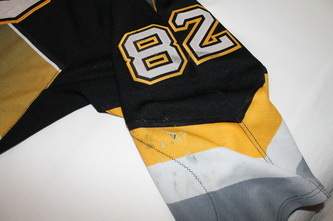 This is Max's playoff jersey from the 2008-09 Stanley Cup winning season. 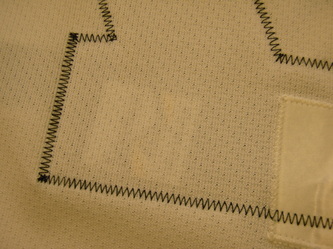 This jersey was worn for home games during the first 3 rounds of the playoffs. 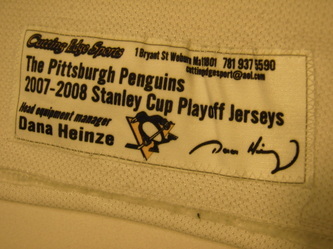 Maxi helped to knock off the Flyers, Caps, and Hurricanes while wearing this incredible piece of Pittsburgh hockey history. I needn't remind you of how he performed in game 7 of the finals @ Detroit. 2 goals + 1 Stanley Cup = Instant Legend. A true Superstar in my collection, Maxime will always hold a special place in the hearts of Penguins fans of this generation. As sad I as I was to see him sign with Philadelphia, I am happy to see he has been a good fit there and is making a notable contribution each night. Let's just hope he doesn't try to SHHH us in the playoffs. 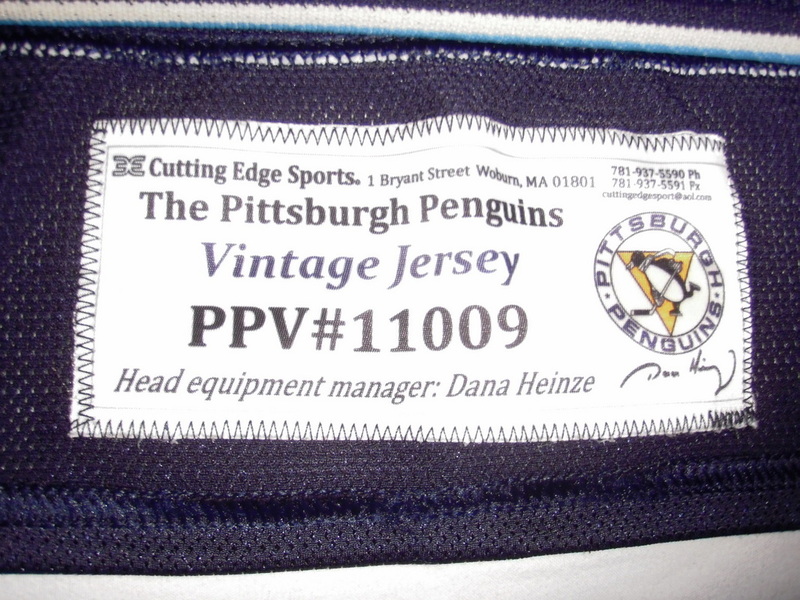 This jersey is a "Vintage" blue alternate that was worn at home in the inaugural season at the Consol Energy Center on February 10th vs the Los Angeles Kings and again on March 12th vs the Montreal Canadiens. This jersey is unique in that in addition to the exclusive individually serialized "Vintage" set tagging, it also has the 2011 Winter Classic wording sublimated into the inside collar as did the jerseys worn in this year's Winter Classic at Heinz Field on New Year's Day. 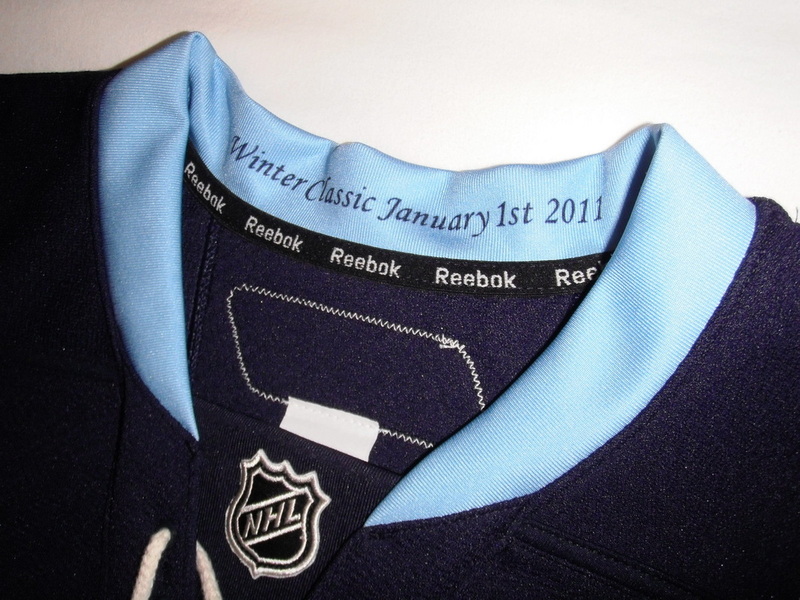 It is believed that this is simply because the manufacturer RBK had already made the blank jerseys as a Winter Classic exclusive design and the Pens decided they'd like to wear them in front of the home crowd in an indoor setting, so the wording was unnecessary but already present in the jersey design. Since the Pens equipment staff didn't want to remove the Winter Classic breast patches from the entire 3rd period Winter Classic set, which the players were ultimately allowed to retain, they simply ordered an entire extra set of this style to be worn in these 2 select games at home. 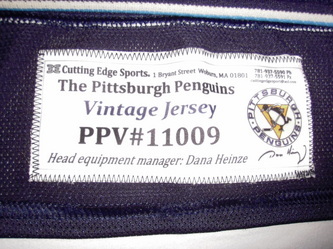 The result is a pretty unique, and highly attractive jersey that will be worn exclusively as the Pens' alternate in the 2011-12 season as they have officially retired the 2008 Winter Classic style baby blue alts. 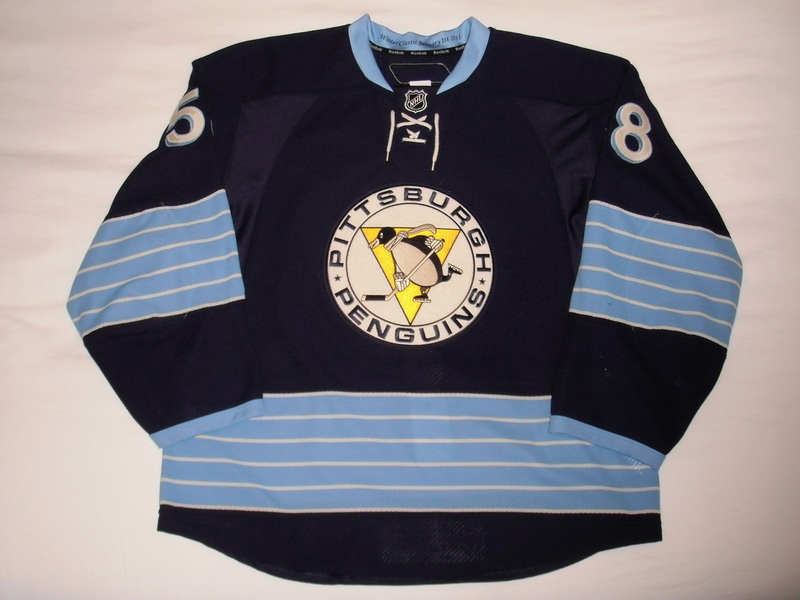 With striping and numbering inspired by the Pens 1967 jerseys, their first season in the league, they also feature the 1967 only logo with the scarfed Penguin. 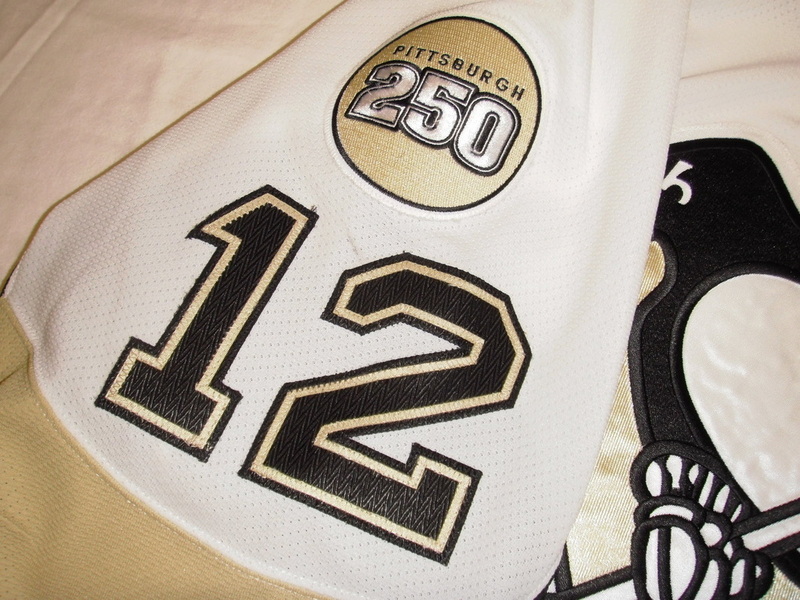 The 2011 Winter Classic marks the first time this logo was ever used on a Penguins uniform. 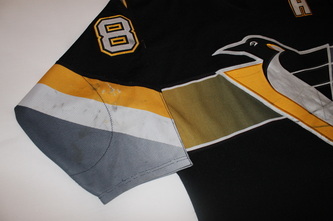 This jersey shows suprisingly nice wear for having been worn in only 2 games. 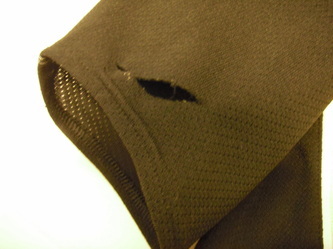 It has several unrepaired holes in the sleeves and a solid 1" wide gaping board burn through both layers of the double reinforced shoulder on the right side. This burn hole can be photomatched several times to photos from the Montreal game. 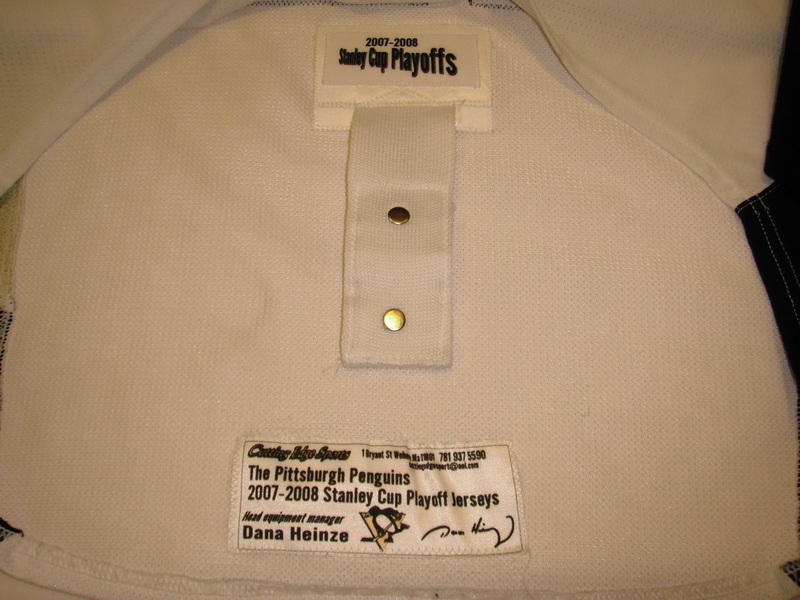 No repairs were present on any of the jerseys from this set as equipment manager Dana Henize didn't feel the need to sew them up after they last came off the ice as he knew they wouldn't be worn again. 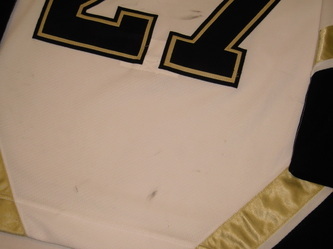 This jersey had the best wear of the entire set, and just so happened to be off the back of one of my favorite Penguins, Norris Trophy contender defenseman Kris Letang. Letang played major junior for the Val-d'Or Foreurs of the QMJHL for three seasons. After recording 32 points in his junior rookie season, he was named to the QMJHL and the CHL All-Rookie Team. 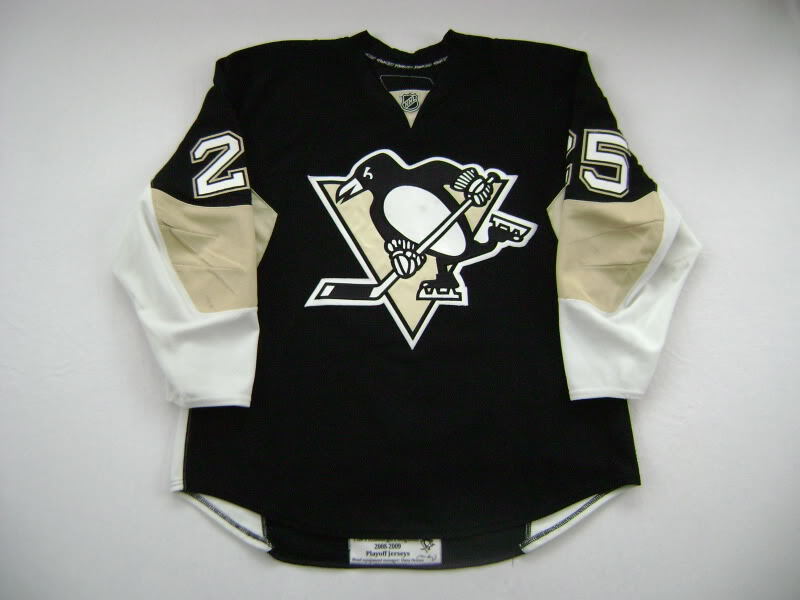 That summer, he was drafted in the 3rd round, 62nd overall, in the 2005 NHL Entry Draft by the Pittsburgh Penguins. The next season, a 68-point effort in just 60 games earned him QMJHL First Team All-Star honours. 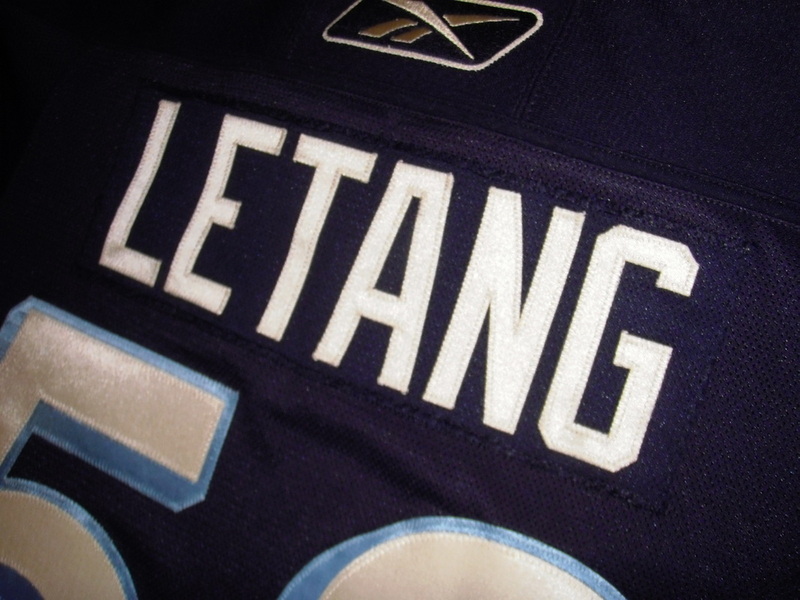 Making the Penguins out of training camp, Letang made his NHL debut in the 2006–07 season. He scored his first NHL goal in his third game, against Rick DiPietro of the New York Islanders in a 6-5 win. However, after two goals in seven games, Letang was scratched twice and then returned to Val-d'Or for further development. Playing in his third season with Val-d'Or, Letang led the Foreurs to the 2007 QMJHL Finals with 31 points in the post-season, only to be swept by Lewiston in four games. Upon the Foreurs' elimination, he was assigned to the Wilkes-Barre/Scranton Penguins of the American Hockey League (AHL), who was in the second round of the Calder Cup playoffs, and recorded an assist in his only game. At the season's end, he was the recipient of three major QMJHL awards. In addition to receiving the Emile Bouchard Trophy, as the best defenceman, and the Paul Dumont Trophy, as the best personality, Letang also received the Kevin Lowe Trophy, as the best defensive defenceman, indicative of Letang's abilities on both ends of the ice. After beginning the 2007–08 season in Wilkes-Barre/Scranton, Letang was quickly recalled by Pittsburgh after recording 7 points in 10 games in the minors. 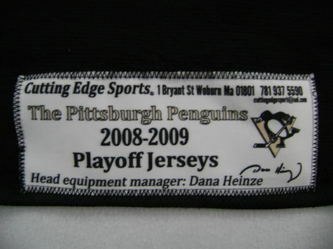 Letang excelled in his rookie season with Pittsburgh, and was invited to the 2008 NHL YoungStars Game during All-Star weekend along with teammate Tyler Kennedy. 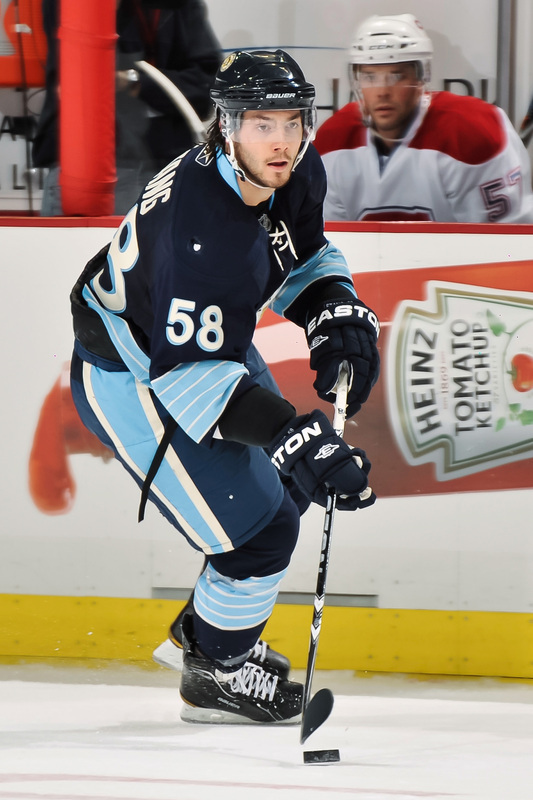 He completed the season with 17 points in 63 games, sixth among rookie defencemen. Making his NHL playoff debut, Letang helped the Penguins to the 2008 Stanley Cup Finals where they were defeated in six games by the Detroit Red Wings. 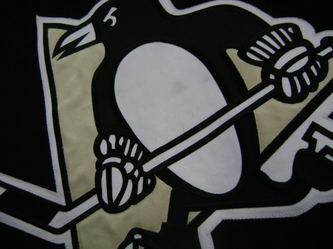 Going into the 2008–09 season, the Penguins' top two defencemen, Sergei Gonchar and Ryan Whitney were both put on the long-term injured reserve, immediately increasing Letang's responsibilities on the team's blueline. He was placed on the Penguins top defensive pairing with Brooks Orpik, replacing Gonchar. The increased playing time resulted in a 10-goal, 33-point season, leading all team defencemen. 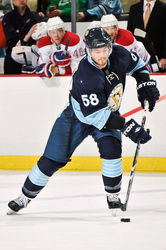 During the season, Letang was also invited to his second NHL YoungStars Game during the 2009 All-Star weekend in his hometown of Montreal, playing for the Sophomores team. 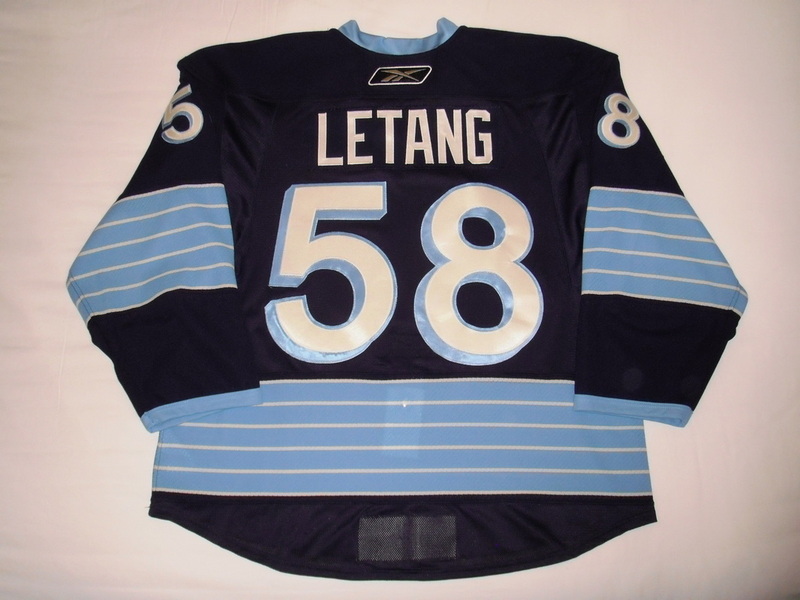 After the Penguins eliminated the Philadelphia Flyers in the first round, Letang scored his first career NHL playoff goal in game three of the second round against the Washington Capitals on May 6, 2009, in overtime. 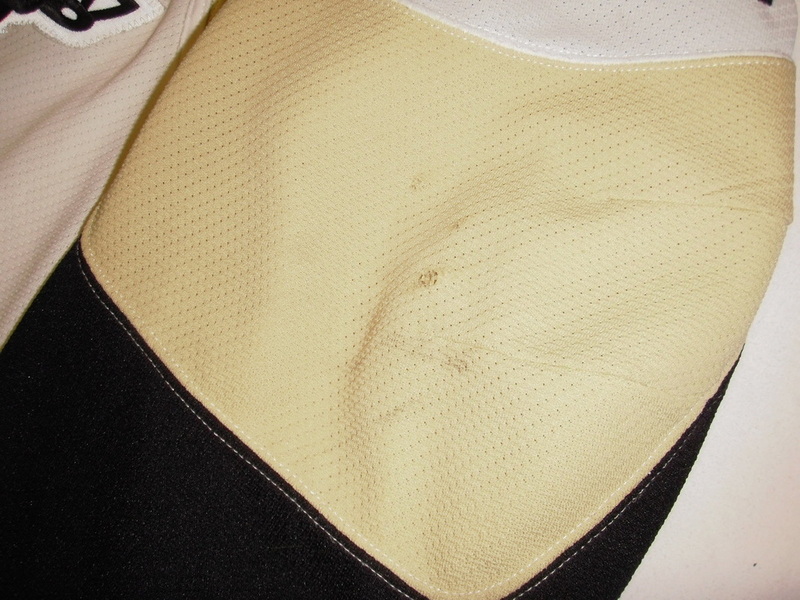 Letang's playing status for the game had been uncertain due to a suspected shoulder injury resulting from a Mike Green hit received in game three. 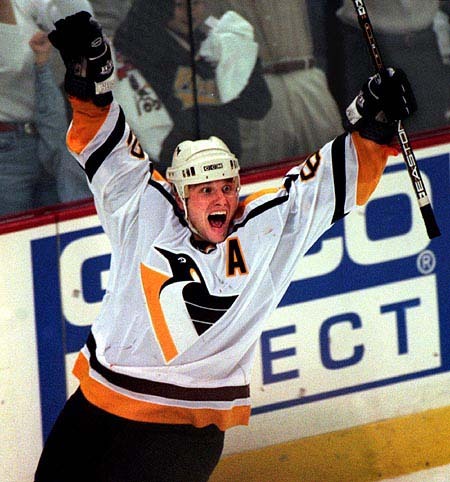 Nevertheless, his game winning goal cut the Capitals' series lead to 2–1, helping Pittsburgh overcome the initial 2–0 series deficit and win in seven games. 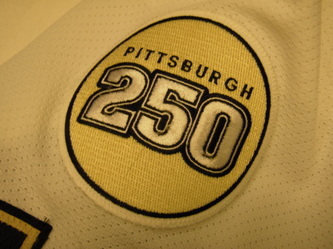 Letang won the Stanley Cup on June 12, 2009, with the Pittsburgh Penguins. They defeated the Detroit Red Wings 2-1 at Joe Louis Arena. 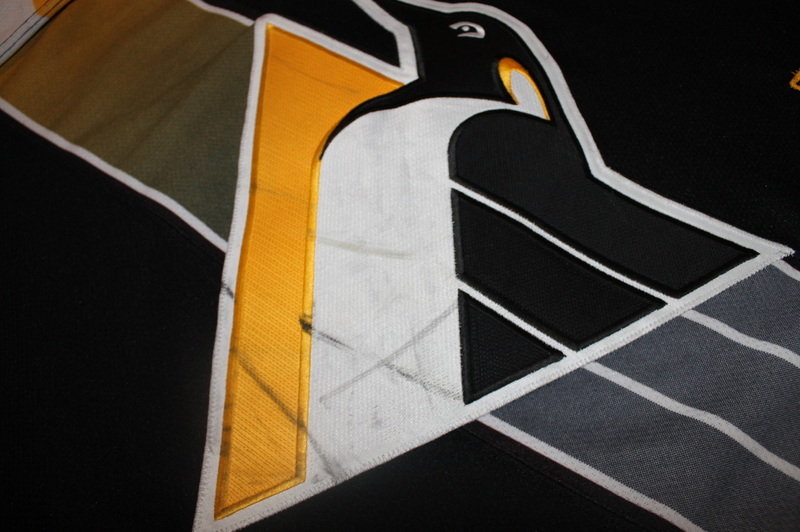 Letang had one goal in the series, in Game 3. 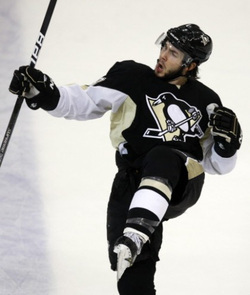 On March 30, 2010, Kris Letang has signed a four-year contract extension that runs through the 2013-14 season with the Penguins worth an annual $3.5 million.